I just wanted to throw my idea in here. 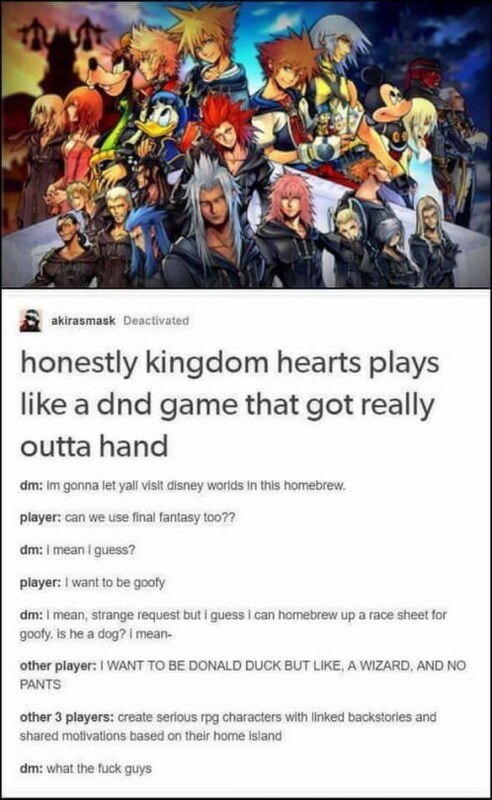 Wouldn't it be interesting to create a Kingdom Hearts themed tabletop RPG in the style of Dungeons and Dragons? I've thought about it several times, and it's something I think could be quite fun. Are you pitching for a tabletop-styled action system integrated with the text-based narrative approach? Mhm, that's exactly what I meant. Your reply is ... empty. Was that on purpose? It's a little bit late I know, but I would be very interested in either running or participating in something like this. I've been half working on a story like it in my spare time. The settings and stories would be mostly original, but it would still be kingdom hearts. There's a template system called BESM (Big Eyes Small Mouths) that is designed for taking anything and turning it into a tabletop game. I've been working on developing a Kingdom Hearts system using BESM and you could do the same. It'd be pretty interesting to see what two people can come up with! I'm probably going to go with something more story heavy than systemically heavy. But I will try to govern it like a tabletop, and I plan to use elements of chance on my end to determine the seriousness of certain encounters. If I were going to introduce a real RP system, I would take a lot more time to prepare, and maybe later I might, but for now I like the idea of just bring principals and basic rules over and letting the rest come out in the posts.